The normal colour form is yellow or yellowish white with very pale brown thoracic lobes (see picture below). In 2003, a white morph of Chromaphis juglandicola was discovered in Sacramento Valley, California. The white morph has since been reported by Wani & Ahmad (2015) working in the Kashmir valley, India. Wani & Ahmad found there was no difference in the developmental characteristics of white and yellow aphids, but white morphs had a slight reproductive advantage in the first two days of adult life. White form of Chromaphis juglandicola, picture courtesy of JEZ under a Creative Commons Attribution Non-commercial 3.0 Unported License. 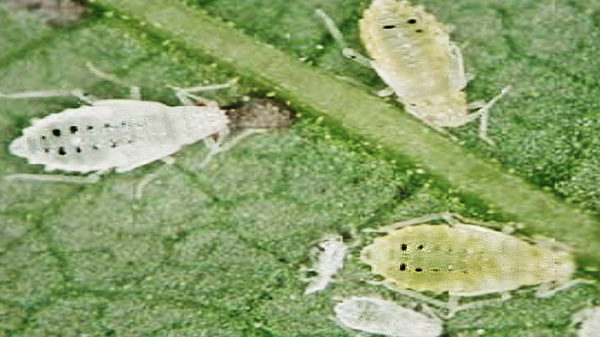 Of the walnut aphid population present in the orchards of the valley, white morphs accounted for zero to 35% in the month of May, 2013 and 77.6% to 93% in September, 2013. Percentage of each morph showed fluctuations during the years with a declining trend in numbers towards Oct-Nov. The percentage of white morph compared to yellow one increased during the same period. Nowierski & Gutierrez (1986a) assessed the microhabitat distribution and spatial dispersion patterns of walnut aphid eggs and viviparae in a commercial walnut orchard in California. They found significantly higher egg densities on the smaller peripheral branches of walnut trees than on larger branches. The spatial dispersion patterns determined for walnut aphid eggs were generally aggregated except at extremely low densities where the pattern was random. Substantial variation in aphid density was observed among basal, middle, and terminal regions of the trees. Significantly higher aphid densities were found on the middle and distal leaflets of compound leaves. Within-tree, among-tree, and among-compound leaf distribution patterns showed that the aphids were generally aggregated. Nowierski & Gutierrez (1986b) fitted mean and variance estimates of eggs and viviparae to Taylor's Power Law. Highly significant correlation coefficients suggested that the Power Law fitted the data well. These data were used to generate optimal numerical and binomial sample size curves for these life stages of the aphid. Wani & Ahmad (2014a) & Wani & Ahmad (2014b) examined how the two species of walnut aphids Chromaphis juglandicola and Panaphis juglandis interact on walnut. Panaphis juglandis is much larger than the Chromaphis and lives entirely on the upper surface of leaves. Chromaphis juglandicola, on the other hand, feeds on lower surface of leaves (see picture of adult alate below). They found that walnut orchards infested with one species usually do not have other. In laboratory studies they demonstrated that competition with Chromaphis juglandicola was an important factor limiting population growth rate of Panaphis juglandis (for more details see Panaphis juglandis). We found the two species together on the same walnut tree on one occasion, but the numbers of Panaphis were very low on the honeydew-spattered leaves. The black hunter, Leptothrips mali, is one of the most common and widely distributed of the predacious thrips in North America. It is usually of minor importance in the control of injurious insects as it occurs in small numbers and has a very low reproductive capacity. Bailey (1940) observed Leptothrips preying on nymphs of the Chromaphis juglandicola as well as other pests on walnut. Sluss (1967) observed populations of walnut aphids and associated insects over a four year period in several northern California walnut orchards. Temperature, leaflet age, amount of prior aphid feeding and coccinellid predation were found to be the most important factors influencing walnut aphid population changes. Sharp declines in aphid population levels were correlated with high temperatures, especially when several days occur with maxima over 100°F. Temperatures may also affect aphids indirectly by directly affecting coccinellid beetles. Early spring temperatures influence the leafing-out of walnut trees. Cool spring temperatures can delay leafing-out, thus postponing the aphid population increase. Coccinellid beetles were the most important predators encountered in the study, and were sometimes the key factors regulating aphid numbers. Aphid parasitism was not important. Cecilio & Ilharco (1997) conducted field studies on the walnut aphid and its natural enemies in Portugal. Primary parasitism by Trioxys pallidus and hyperparasitism by Pachyneuron aphidis Asaphes suspensus, Syrphophagus aphidivorus and Alloxysta sp. were observed. Early and frequent insecticide applications were not associated with lower levels of aphids and can disrupt the presence of Trioxys pallidus. The occurrence, early in the season of 50% hyperparasitism was associated with low numbers of mummies. The aphidophagous coccinellids observed in walnut orchards were Adalia decempunctata and Oenopia conglobata. These can occur with low numbers of aphids per leaf (1 aphid per leaflet). The species of aphidophagous Syrphidae larvae collected on leaves with aphid populations were Meliscaeva auricollis and a Syrphus sp. 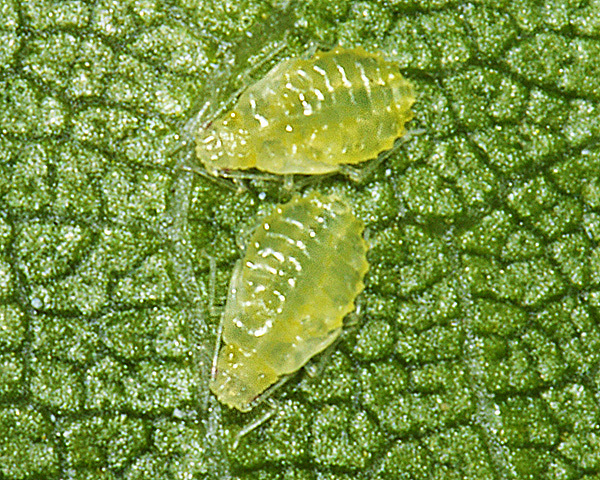 The syrphid larvae were observed in orchards with high levels of aphids (20 aphids per leaflet). Chrysopidae (eggs, larvae and adults) were also observed on the leaves. In Turkey Ozkan & Turkyilmaz (1987) studied the population fluctuations of Chromaphis juglandicola on untreated pecan trees at the Citrus Research Institute in Antalya. Each week, the nymphs and adults on 10 leaflets/tree were counted. In mid-May, Chromaphis juglandicola reached a peak, with a density of 11 aphids/leaflet. Natural enemies present were the primary parasitoids Trioxys angelicae and Diaeretiella rapae, while a charipid of the genus Alloxysta was found to be a hyperparasitoid. Several researchers have looked at the ecology of Chromaphis in Poland. Jaskiewicz & Kmiev (2007) studied the population dynamics of aphids colonizing walnut trees in street and park sites in Poland in relation to weather conditions. The weather in spring probably had no effect on the date of hatching of the larva of fundatrix, which was usually observed in the third 10-days' period of May. On the other hand, the dry period, heat waves (above 30°C) and heavy rainfall affected the break in the aphid population observed in July and August. The maximum population of Chromaphis juglandicola was at the turn of June and July. In some years the dominating species was Chromaphis juglandicola, while in other years it was Panaphis juglandis. Karczmarz (2010) compared numbers of Chromaphis juglandicola on common walnut in Lublin town plantings. It was established that Chromaphis occurred most numerously in the year 2007 on the housing estate post. It was mainly found on the underside of the leaves. The times of spring appearance and autumn disappearance of aphids were significantly affected by the course of weather conditions. Their development was enhanced by a warm spring with not very intense precipitation. An air temperature above 30° C and heavy rain in summer limited numbers. The picture below shows two fourth instar alatiform nymphs of Chromaphis on walnut on 29 May 2011. Rakhshani et al. (2004) studied seasonal parasitism and hyperparasitism of Chromaphis juglandicola in Tehran, Iran. Five species including two primary parasitoids, Trioxys pallidus and Aphelinus asychis as well as three hyperparasitoids, Alloxysta citripes, Pachyneuron aphidis and Syrphophagus aphidivorus were identified and the seasonal fluctuations in their populations monitored. Trioxys pallidus appeared to be fully synchronized and adapted to Chromaphis juglandicola, but Aphelinus asychis was found less often, and seemed poorly adapted to walnut aphid or its habitat. Trioxys pallidus had a spring population peak, following changes in its host densities, and a summer disappearance, which was followed by a weak autumnal increase. Trioxys pallidus overwintered as mummies on the soil after leaf fall. The efficacy of Trioxys pallidus was restricted mainly by Alloxysta citripes which seemed to be a specialized hyperparasitoid of this wasp species. The two other hyperparasitoids were more generalist. Rakhshani et al. (2004 studied Trioxys pallidus in the laboratory under constant conditions. Populations of the walnut aphid and its parasitoid were collected from the field and reared on walnut seedlings in a growth chamber. 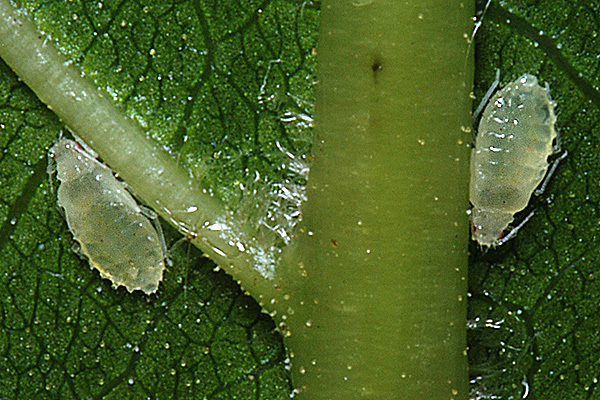 Juvenile mortality of the parasitoid was 53.5, 8.0, 2.3 and 6.7% for the first to 4th instar nymphs of host aphid, respectively. Trioxys pallidus had a greater preference for the 3rd and 4th instar nymphs than the others. The functional response of the parasitoid was type III. Blackman & Eastop list 8 species of aphid as feeding on European walnut (Juglans regia) worldwide, and provide formal identification keys. Aphid feeding can reduce tree vigour and nut size, yield and quality. This may be as a direct effect of loss of nutrients, or from accumulation of honeydew. Sooty moulds grow on the nutrient rich honeydew turning the husk surface black, and increasing the chance of sunburn on exposed nuts (UC Pest Management Guidelines). Chromaphis populations of over 15 aphids per leaflet early in the season reduces nut yield and quality, and cause an increase in nuts with perforated shells. Summer infestations lower nut quality. Chromaphis juglandicola can be one of the most destructive insects attacking walnut in many countries of the world. Where the aphid is indigenous, it is normally kept in check by its natural enemies. But in northern California in the 1950s, natural predators were rather ineffective and the aphid occurred in large numbers each year. Chemical control measures were therefore thought to be justified. Michelbacher et al. (1950) noted that aphicides should be applied when they will have the least adverse effect on the balance between pest and predator. This was thought most likely to be when the aphids averaged about 10 per leaflet and were increasing. Usually the predator population was very low and the aphid population about to expand rapidly at this point. The insecticides used against the codling moth (Cydia pomonella) on walnut tended to increase the aphid problem, and when DDT was used in the spray programme it was recommended that it should be in combination with an aphicide. A spray against codling moth was usually desirable during the first half of May. Three years' results indicated that the addition of an aphicide at that time controlled Chromaphis and had the least adverse effect on the balance between aphid and predators. It also made the application of spring irrigation possible without the development of a destructive aphid population while the orchard was under water. Aphicides tested included nicotine dry concentrate, crude benzene hexachloride, parathion wettable powder and tetraethyl pyrophosphate. All resulted in excellent control of the aphid when the sprays were thoroughly applied, and no serious objections to the use of any of these aphicides was encountered. It was felt that the nicotine dry concentrate offered the least hazard as an aphicide. At the dosage used in these applications, both parathion and TEPP were very destructive to natural enemies, and an exceptionally good kill of the aphid was therefore needed to avoid the risk of a serious and rapid increase in aphid population. Madsen et al. (1964) noted that in northern California it was necessary to apply a regular seasonal spray to control both the walnut aphid, Chromaphis juglandicola, and the codling moth, Carpocapsa pomonella. It was advantageous to the grower if a single compound would control both pests, as the timing of the first spray is the same for the two insects. Experimental field plots were established to evaluate compounds that might serve this dual purpose. Phosphamidon and Bidrin® gave good control of both walnut aphid and codling moth. Endosulfan II (the high melting isomer of endosulfan) also showed promise against both pests while endosulfan was effective only against the walnut aphid. Morestan gave excellent control of walnut aphid and spider mites, but was not effective against codling moth. Dimethoate was an excellent aphicide, but caused phytotoxicity which would preclude its use on walnuts. Imidan® and Bayer 37344 controlled codling moth, but the walnut aphid increased on the plots to higher numbers than were recorded upon the unsprayed check and both of these were toxic to predators. Barnes & Moffitt (1979) carried out a five-year study of the effects of the Chromaphis juglandicola and the European red mite (Panotlychus ulmi) in a coastal walnut orchard in California. By using four 4X4 Latin squares of single tree plots, selective pesticide regimes controlled or permitted aphid or mite populations that developed annually for 3 years, after which both species were controlled on all trees for 2 years. Yield reductions by aphids averaged 25% over the first three years, and continued at 28 and 43% during the 4th and 5th years after control was re-established. Mite infestations had no effect on yield until the 3rd year when there was a 40% loss; losses of 20-30% persisted after control was re-established. The symptom of effects upon the tree which proved to be the most sensitive to infestation by aphids or mites proved to be loss of productivity of catkins. After the 2nd and 3rd year of infestation, there was an average reduction in number of catkins of 68% attributable to aphids, 61% to mites, and 85% when both species were present. Aphid infestation reduced walnut size and increased shrivelling of kernels, perforation of shells, and adhering hulls. European red mite had no effect upon nut quality. This experiment demonstrated that severe long-term effects by leafcell sucking arthropods on orchard tree productivity extend at least 2 years and probably much longer after return to control of infestation through chemical intervention. The development and implementation of a biological control programme for Chromaphis juglandicola in California is one of the classics of biological control brought about by introduction of a natural enemy imported from the original 'home' of the pest aphid. 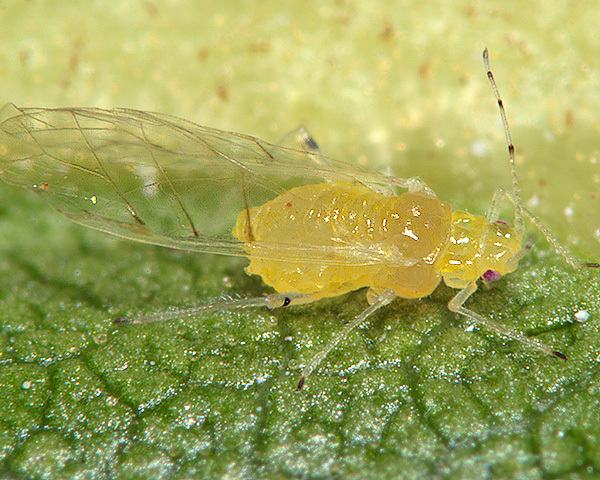 The walnut aphid is indigenous to south-eastern Europe where it is parasitized over most of its range by the parasitoid Trioxys pallidus (see picture below). 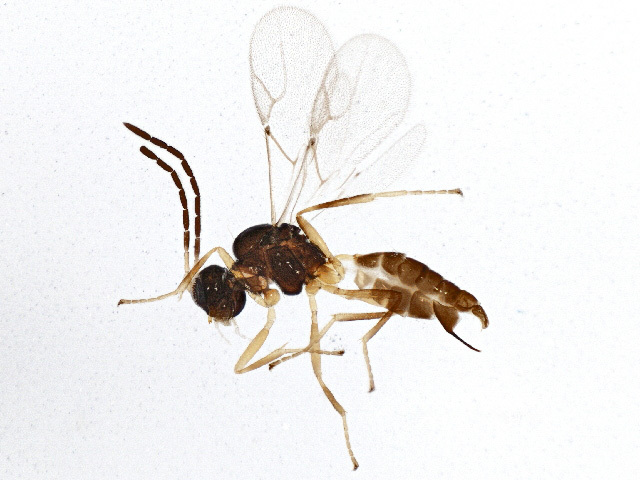 That parasitoid was not naturally present in California, but was introduced in 1959 from France. It did not initially thrive, except under the less harsh conditions in coastal S. California. Then in 1968 an Iranian strain of Trioxys pallidus was introduced into central California. The wasp from Iran was much better adapted to the summer heat and low humidity of central and N. California than the French strain, and van den Bosch et al. (1970) reported very promising results for the control of Chromaphis juglandicola. Adult Trioxys pallidus, picture courtesy of Centre for Biodiversity Genomics under a Creative Commons Attribution Non-commercial Share-Alike (2013) licence. Frazer & van den Bosch (1973) assessed populations of Chromaphis juglandicola and its natural enemies weekly during the growing season in 1969, and every 4 days in 1970. A parasite of the aphid, Trioxys pallidus from Iran, was released and became established in the study area in 1969, but it did not affect the abundance of the aphid during that season. Large numbers of mummies overwintered, and the normal peak in aphid numbers in spring 1970 did not occur. Aphid numbers remained at levels about 0.01-0.001 of those in previous recorded years. 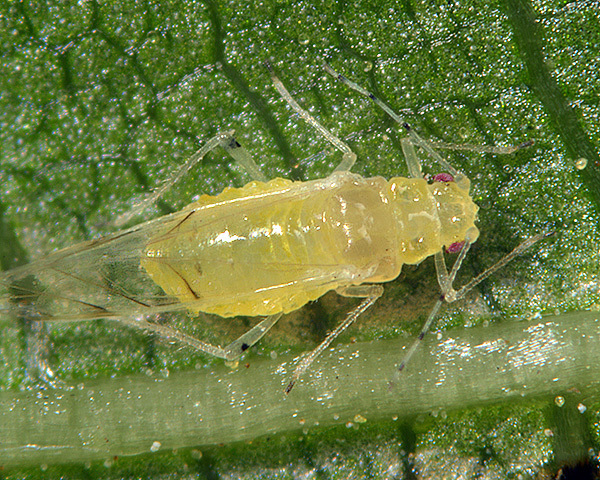 An experimental release of aphids and use of a biological check method demonstrated that the parasite was responsible for the maintenance of the aphid at low numbers. The same tests showed that selective predation of parasitized aphids by the Argentine ant lridomyrmex humilis presents a serious threat to continued control of aphid outbreaks by the parasite where ants are present. The rapid increase in the artificially induced outbreak of aphids indicated that it was not high temperatures that had previously kept aphid numbers low in summer, but leaves made unacceptable by sooty mould and debris from the spring peak of aphid numbers. van den Bosch (1979) assessed the interrelationship of an Iranian ecotype of Trioxys pallidus (Hal.) (Hymenoptera: Aphidiidae) and the walnut aphid, Chromaphis juglandicola over a 4-year period at two localities in California. Limited additional data were obtained from other localities. Trioxys pallidus, a highly efficient parasite, which is biologically adapted to and phenologically synchronized with Chromaphis juglandicola, has brought about substantial biological control of this pest. Trioxys pallidus substantially dampens the aphid's spring oscillation, and normally restrains the amplitude of the summer and autumnal oscillations. Major economic benefits have been realized by the elimination of the aphid as a pest in springtime. Trioxys pallidus is at times heavily attacked by non-specific hyperparasites, but these, at most, hinder it but slightly. Certain insecticides can disrupt Trioxys pallidus activity, permitting aphid outbreaks. 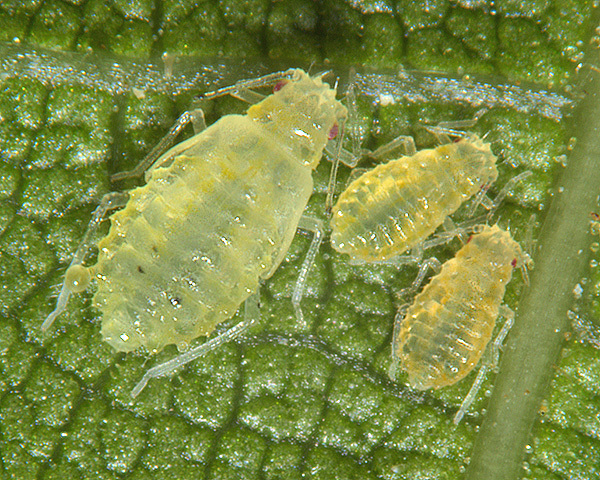 Prolonged aphid scarcity, possibly abetted by hyperparasitism, also may cause a breakdown in parasite activity and a temporary aphid resurgence in midseason. During the 4 years of investigation, this occurred on one occasion in one of the study plots. More than one-half million dollars have accrued annually to the California walnut industry as a result of the Chromaphis juglandicola biological control program. Hougardy & Mills (2009) studied the factors influencing the abundance of Trioxys pallidus 35 years after its successful introduction in California, and in the presence of continued hyperparasitism and intraguild predation. The seasonal activity of Chromaphis juglandicola and Trioxys pallidus were monitored in 2005-2006 in relation to hyperparasitism and mummy predation in three orchards. Walnut aphids remained under the economic threshold in all three orchards with insecticide treatments for other pests in some cases reducing aphid populations as well. No significant density-independent or density-dependent aggregation in the risk of hyperparasitism was found at the individual tree scale, suggesting the absence of a refuge from hyperparasitism. In contrast, significant negative density-dependent aggregation in the risk of intraguild predation was found, but no density-independent aggregation, suggesting a refuge at higher mummy densities. Using a linear mixed effects (statisical) model, the following factors were found to influence mummy density: (1) aphid density from the previous sample date and (2) intraguild predation, with the latter linked to hyperparasitism from the previous sample date through a significant interaction that appears to be mediated by current aphid density. We especially thank Robin & Rosie Lloyd, The Long House Garden, for their kind assistance and permission to sample. Aliniazee, M.T. & Hagen, K.S. (1995). Walnut Aphid - Part I: Nechols, J.R. (ed). Biological control in the Western United States. University of California. Flint, M.L. (2003). Integrated Pest Management for Walnuts. Third edition. University of California Statewide Integrated Pest Management Programme. Agriculture and Natural Resources Publication 3270. Hoy, M.A. (1995). Walnut Aphid - Part II: Nechols, J.R. (ed). Biological control in the Western United States. University of California. Ozkan, A. & Turkyilmaz, N. (1987). Determination of population fluctuations of the walnut aphid (Chromaphis juglandicola Kalt.) (Homoptera: Callaphididae) damaging pecan trees and of its natural enemies in Antalya Province. pp.99-107 in: Turkiye I. Entomoloji Kongresi Bildirileri, 13-16 Ekim 1987, Ege Universitesi, Bornova, Izmir. 1987.
van den Bosch, R. et al. (1970) . Trioxys pallidus - an effective new Walnut aphid parasite from Iran. California Agriculture 24(11), 8-10.